Look to see whats missing/changed from the parse table. I've decided not to delete anything that exists in the parse table but not in the Google Apps Workbook. So the workbook can be considered to be an incremental update, rather than a replacement. This way, we'll minimize the amount of back and forwards to parse. 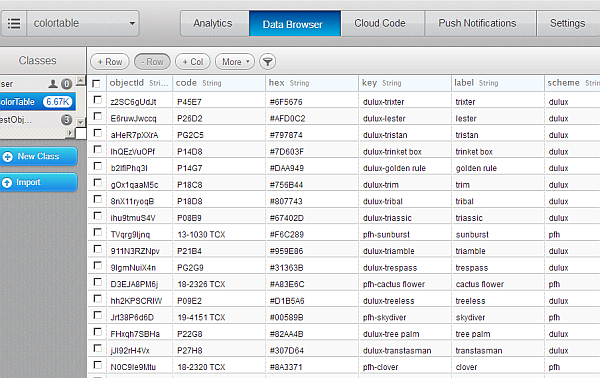 Here's what the data looks like in the data browser once loaded. Here's the whole application. All the components are async, so we're heavily using promises to bring it all back together again. I already covered the query limits. To avoid rate throttling on Writes, I waited a bit between saves, and used Parse.Object.saveAll(), instead of object.save() to be able to batch up writes together. Aside from being a bit fiddly because of the asynchroncity, and the few tweaks, it was all pretty straightforward. Now for the GAS/ScripDB version of loading.